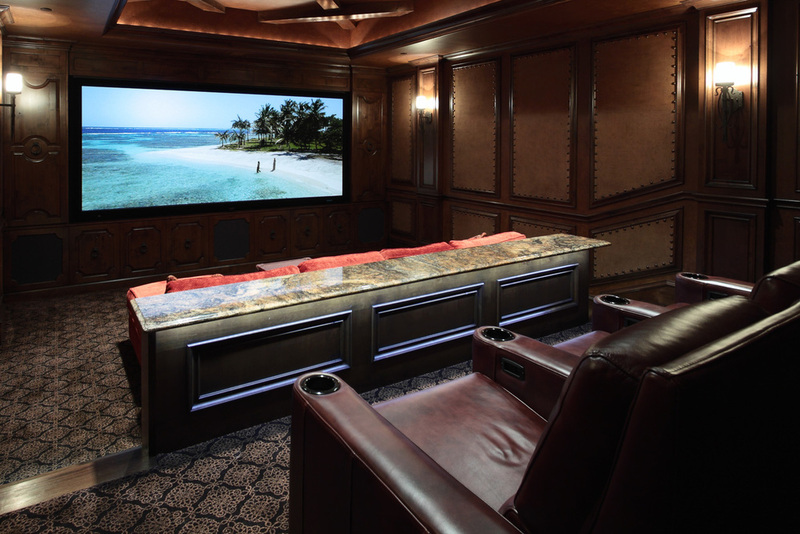 Building this exceptional home cinema system in Westlake, TX was a pleasure from day one. First, our client embraces and loves new technology. Also, he's owned multiple home theaters, and wanted to step up the performance in his new media room. We started by choosing a video screen with a 2.35:1 aspect ratio. This allows the family to experience movies in the same format as the commercial theaters. He also wanted a performance level from the electronics and speakers that would be visceral and would immerse you in the movie. He wanted something substantial. We enjoyed a wonderful synergy between the homeowner, builder, and interior designer, which led us to our end goal. The construction of the room is structurally sound, and heavily reinforced with 2x6s. The entire room has been insulated to help keep the sound inside the room and minimize sound leakage to the rest of the house. The riser base for the back row of chairs was built and reinforced with wood screws, and was fully insulated. In addition, the walls have been sheetrocked with Quietrock. This treatment substantially keeps the sound from traveling between walls because of its high density coefficient. Because the media room is on the 2nd floor, a sound barrier was added to the floors to provide an additional layer of sound control within the room. The finished walls were treated with custom acoustic panels from Auralex. We applied absorptive, reflective and diffusive treatments throughout the room to create a well-balanced acoustic environment for music and movies. The interior designer brought in a faux painter to create a leather-like texture on the walls. She very creatively faux painted the acoustic cloth panels to match the leather look and feel of the room. The results are amazing. A 7.2 complement of Triad speakers are optimally located within the room. The front three LCR speakers are positioned behind an acoustically transparent Stewart video screen. The four surround speakers are located in a horseshoe-shaped configuration and fully envelope the listener with all the subtle (and not-so-subtle) special effects. Two Triad Gold subwoofers are placed in the corners and are dialed into the room for maximum output and tautness of bass. Triad builds an in-wall speaker that is fully baffled which minimizes any sound loss through the walls, and the performance is outstanding. The electronics featured in this media room are very cutting edge. 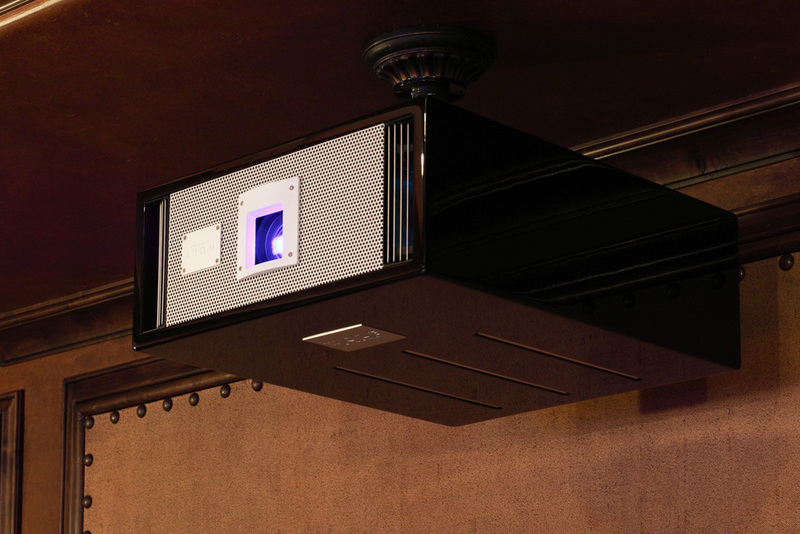 A Wolf Cinema projector with a Variscope lens allows us to set up the most popular aspect ratios and project a brilliant light on a 143" diagonal screen. We utilized the latest pre/pro from Integra as well as Class D amplification from Bel Canto. The Integra incorporates Audyssey digital correction circuitry, which measures the room’s properties/acoustics and maximizes the sound in the room. The sources include an Oppo Blu ray player, AM/FM, DirecTV HD and AppleTV. The entire system is controlled by an RTI touchscreen remote for easy, intuitive control. The sound is effortless and it is a match made in heaven. The room consists of two rows of seating. The front row is a very comfortable pit seating group and the second row utilizes leather theater chairs. All of this leads to a well-appointed, acoustically superior media room. After we finished the media room, we were asked by the homeowner to put together a system for his family room. The cabinet was built to spec, and we installed a system that provides daily entertainment for the family. All the electronics are hidden, and the TV frame is concealed by a cleverly crafted wood bezel that gives it a beautiful built-in look.